It's easy to get attached to a dish before you've even tasted it. An idea strikes you and you think about it for days. You write the idea down instead of working, to see how it looks on paper. Perhaps some mustard vinaigrette to round off the sweetness of the beetroot? Damn that's good, if I finish these summaries in the next 20 minutes I can still get to the shops to pick up some dill. You tidy up the kitchen bench — you require a clean workspace to create magic. You work meticulously, even bothering to make the horizontal cuts in the shallot for a perfect dice. The cooking smells are amazing. You plate up like you're sending it to Gordon Ramsay's pass. If you're a food blogger, you take a photo framing the food slightly off center. You can zoom in more than that, so you do. By this stage it almost doesn't matter what the food tastes like, you've already had your fun. But you've got to eat. The food has the advantage of two days of convincing yourself it will taste like mana from heaven, but the disadvantage of high expectations. You taste it and it's great. Well done, you. Unfortunately it doesn't always work out that way, and my sweet potato gnocchi was one such example. Damn sweet potato. Too sweet for savoury dishes, and not sweet enough for desserts. Mushy and sticky rather than creamy. Slightly fibrous. I don't get it, why does everyone like sweet potatoes? 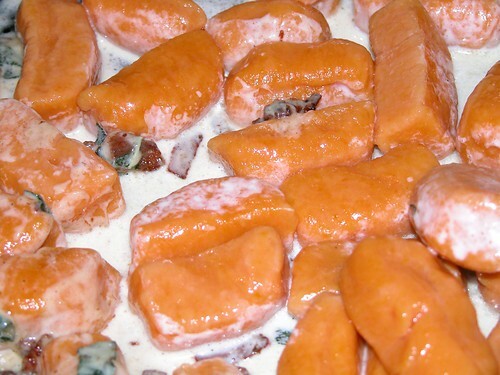 Why did I make sweet potato gnocchi? What did I think it would taste like? Well, no man is an island, and this man's favourite taster happens to love sweet potato and specially requested it. This is the same taster to who was kind enough to eat the whole bowl when I made my first (undercooked) risotto. I had to give something back. I even had myself convinced I would love it. First there was xfinity.net. With its dynamic, futuristic, and sensical name it lasted 3 years and saw me through years 8 to 11 of high school. After that came tweedtrousers, which was short-lived but no less critical to my personal development and lack of romance in year 12. Then as uni began I flirted with livejournal before discovering she was emotionally unstable and just a bit too emo for me. In the following year I gave the whole blogging caper one more shot before moving on, having realised that voicing my every inane thought to was what close friends and strangers on the bus were for. But here we are, another blog. Forget the tedious personal minutiae. I hope to fill these pages with food and drink, and I hope that it will make you hungry.